This elegant practice blade is designed to help you perfect your martial arts forms safely. This Polypropylene S-Guard Dao Sword blends modern technology with classic design to create an attractive and durable training sword. This polypropylene sword displays a silver colored, single edged blade with an undulating hamon line. A narrow fuller runs parallel to the spine of the straight blade. 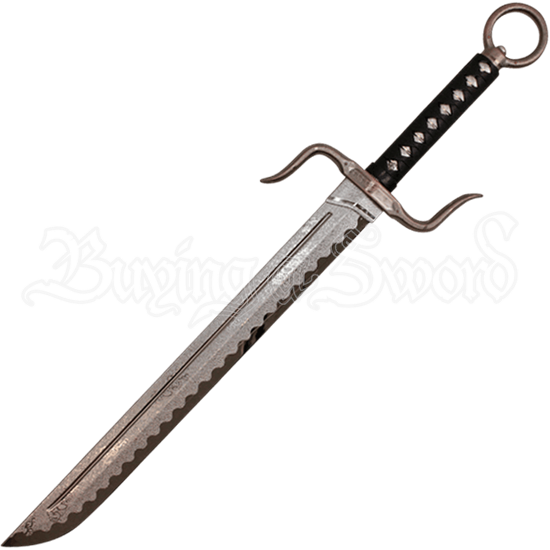 One of the copper colored S-curved quillons bends back to protect your hand while the other bends forward to trap your opponents blade. The two handed grip has a black and silver colored wrapped texture for a secure hold, finishing with a copper colored ring pommel. The crossguard and pommel are removable for storage and transport. A smashing choice for simulated combat, the Black Polypropylene S-Guard Dao Sword also makes an exemplary prop for cosplay conventions, Halloween parties, and reenactment events.